I've been a fan of Kori's since she got dragged into SL last September, with her brand of eclectic instrumental electroacoustic fusion. Most of her music is her own original composition, with many diverse influences. It's very melodic and flowing and peaceful. She brings much of her own life into her music, in some ways it's very autobiographical. She's written some new pieces that she's added to her concerts in which she plays the flute, inspired by the history of the Nez Perce tribe, which is truly haunting in its simple beauty. Kori is a delightful person. 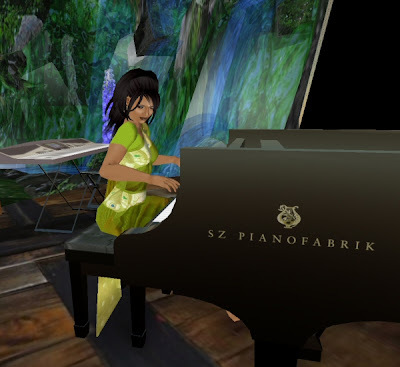 She's jumped right into the SL community and into performing - learning about the ups and downs of SL life and riding the bugs and waves with graceful aplomb alongside her growing and faithful audience. I catch her shows whenever I can - she's a wonderful performer - stop by next time you see her in the events listings! She plays an ever-widening list of venues. Check out Kori's My Space page and her Kori Tunes page lots more info as well. She keeps much of her SL performance schedules up there, as well as links to buy her CDs. Thank you so much, Kori! Always a delight! Thank you for your thoughts about my music. I always enjoy playing and meeting everyone. I sent out a newsletter putting your blog post to encourage more fans to join SL! Yes its my fault! hahaha. Take care and thanks again.